I hate that it's all the rage and may never go away. I hate that they're trying to phase out 2-D and the rest of us who like the old-fashioned motion pictures by giving us only three show times to choose from in order to see it in 2-D. But do you hear me, movie theaters? I will do it anyway. I will choose the 2-D option until you are only offering one showing at 12:05 p.m. on a Tuesday. I will never surrender. I just don't see the point.Why are we going through so much trouble to recreate what we see every other second of the day? I see in 3D ALL THE TIME, guys. ALL the time. Do I really need to view animation in 3D? Is 2D just not good enough for me anymore? How many D's do I need to enjoy the Lorax? Who do I think I am? You have to wear glasses. On your face. While you're watching a movie. Or else you just can't watch it. GLASSES WEARERS, I ask you: what are you supposed to do? I can only imagine you have to choose between wearing two pairs of glasses on top of one another like a goon and not be able to see anything at all (either due to the lack of real glasses or lack of 3-D glasses). You can't win. The images never QUITE come into focus for me. I think my eyes just get overloaded trying to make the images line up through magic sunglasses while simultaneously keeping up with the action on the screen. It's exhausting. Especially in live action movies. And I'm always AWARE that I'm still wearing the glasses. I never just forget I'm wearing flimsy third-rate Ray-Bans digging into the side of my head. How am I supposed to become invested in Lucy and Edmund's adventure on the Dawn Treader in a series of swashbuckling encounters when it's taking all I have just to focus on them as they dash across the screen? Gimmick shots. For the most part, I feel like filmmakers have toned these down. But every time they make it seem like the audience is peering out from behind the rungs of a ladder or a bird flies by my face, I know they did it solely because the movie is in 3-D. It feels really awkward and forced--like they're saying "hey! Look! 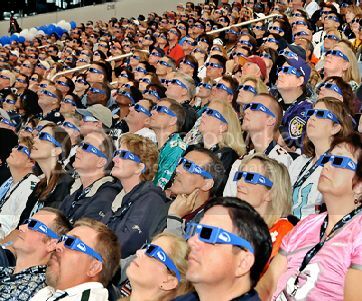 In case you didn't notice, those glasses you're all wearing enable you to perceive depth! Isn't it AMAZING? It's like it's COMING RIGHT AT YOU! It's like you're IN the movie!" Ugh. You have to pay more. It takes a lot for me to justify the regular price of movies, let alone 3D. Thirteen dollars to cross my eyes for two hours while I try to distinguish shapes on a giant screen? No thanks. It's quite possible I'm just a (lovable) curmudgeon like Liz Lemon. I propose we ban it before it goes further. Just put a stop to it right now. I don't want it to reach the point where I have to pay $20 per ticket to be in a virtual reality simulator while I watch the next pixar movie. I just want regular D. Good ol' fashion flat entertainment. Is that too much to ask? My ONLY exception to this rule is Disney re-releases. Because I will go see Lion King or Beauty & the Beast in theaters in any capacity. Worth it. The thing about any other movie in 3D is that we don't know if it's going to be worth A) the extra money or B) wearing the aforementioned nerd goggles. With Beauty and the Beast, there's no question. I'd watch that movie on a big screen any day, even if it was in 4-D and we had to endure the wet-dog smell of the Beast in the scene when it's raining and he's fighting Gaston on the castle roof. Because it's Beauty and the Beast. But the Squeakuel? I'm just not so sure. You decide: Am I just a party pooper who hates everything fun? Or are you with me on this? Follow-up question: Do you like a movie any less just because you don't feel your heart in your throat when soaring above the city in the opening credits? Older PostIs James Marsden 30 Rock Material?